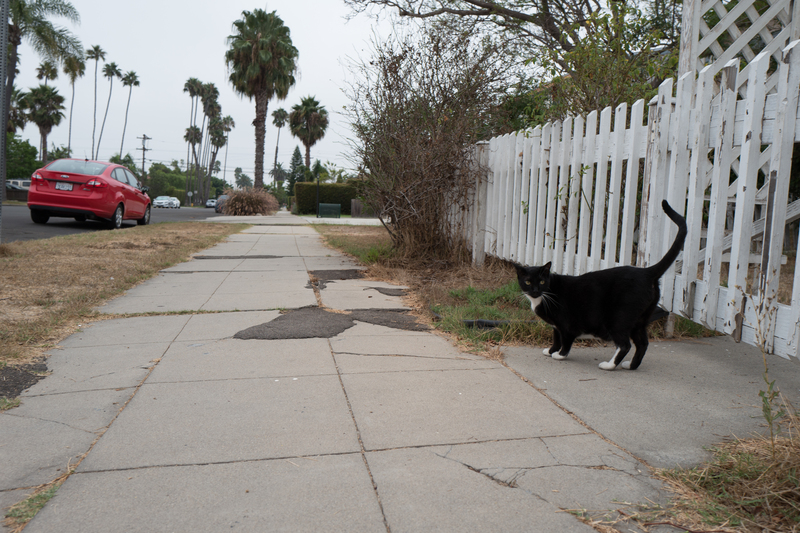 Meet the third furball seen on Sept. 5, 2017, along the same Alabama block, between Adams and Madison. While Itchy Valentino hid under a car, Goldie howled at the tuxedo, who is ninth of that color-combo featured in this series, since its start 11 months ago. The others: Fraidy, Jellicle, Patience, Pepe, Poser, Sammy, Spot, and Tux. I shot the Featured Image—and its companion—using Leica Q at 8:40 a.m. PDT. Vitals are identical for each, aperture manually set: f/5.6, ISO 100, 1/125 sec, 28mm. Both are crops, but neither is retouched. 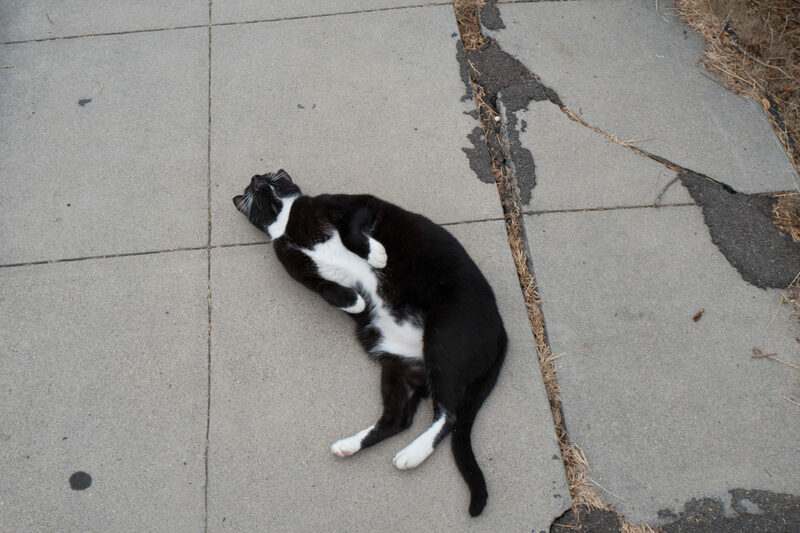 Update, Aug. 16, 2018: I met the Tuxedo’s owner, on a cloudy morning reminiscent of the first sighting—because Goldie and Itchy were out on the sidewalk, too. I had previously called the cat Nine, for number of like-coloration featured in the series, but he is Anthony. The owner’s son, now 17, chose the name. Anthony is about 8 years old. Don’t miss: Scruffy, Roly Poly, Woo, Skull, Biscuit, The Colonel, White, Chipper, Frisky, Stretch, Needy, Farfisa, Mates, Hunter, Pee-Pee, Blue, Blue Too, Bonded Pair, Patience, Fess, Jumper, Frenemy, Looker, Cozy, Scout, Lurks, Skit, Mini, Betty, Black and White, Stalker, Bell, Chill, Sammy, Scratch, Poser, Star, Grey and White, Watcher, Herman, Comet, Roman, Willow, Chub, Nimbus, Watson, Lilo, Kit, Pepe, Twilight, Sebastian, Spot, Booger, Ash, Veruca, Riley, Mellow, Bonde, Flower, Glass, Black, BeBe, Fang, Bruce, Siamese, Pounce, Tortie, Haiku, Fraidy, Peso, Daniel Tiger, Dusk, Stride, Dainty, Spry, Tabby, Betty Too, Still, Levi, Shadow, Sophie, Wink, Ferals, Momma, Charlie, Tux, Cool, Benny, Jellicle, Itchy Valentino, and Goldie.